I’ve been busy doing two things over the past week: playing The Witcher III (it’s awesome) and developing a WPF application for my dad. I originally built him a similar application years ago as part of my college course. The application allowed him to keep track of when he was offshore, and calculated his available days off and vacations for him. It was written in Java, and since I need to practice WPF, I decided to write a new one for him. 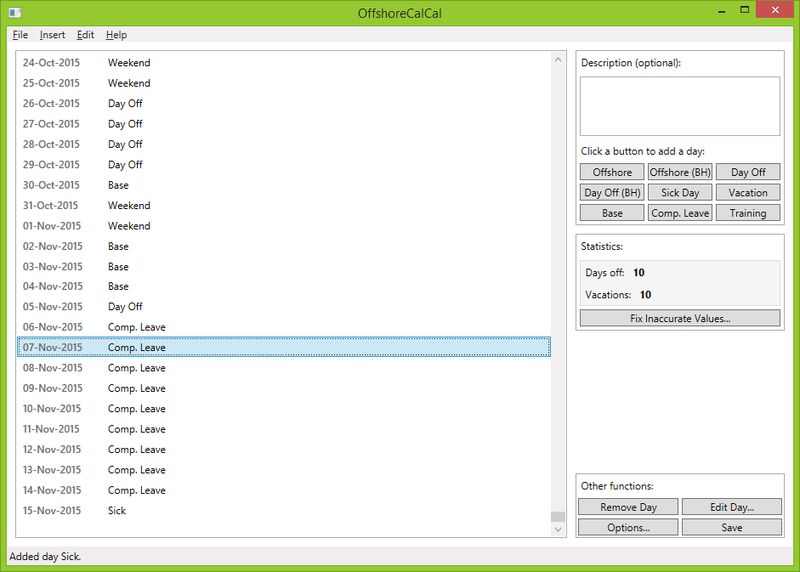 I have chosen to call the new one “OffshoreCalCal” because it’s kinda like both a calculator and a calendar… get it? A beautiful screenshot of my WPF application. I have yet to add a few things: buttons that do what they’re supposed to do, behind-the-scenes math stuff, a basic backup tool, an options window, some little dots of colour to help identify certain day types at a glance, performance enhancements to make the list load faster, and that dialog box that comes up when you try to close the window without saving. I’ve been at it for about a week (on and off), and I think I have made good progress and learned a lot from this. Hopefully another week and my dad can start using a beta version! About a month ago, I thought to myself “Why am I sitting on my bottom playing games? I need to get out there and learn as much as I can about programming!”, and just a single month later, I have gained so much experience in PHP, MySQL, and CSS. However, there is still so much more to learn – especially on the Microsoft side of things. Pretty much every job these days is Microsoft this, ASP.NET that, so I am basically required to learn this stuff. Today, I have begun looking into some of the newer Microsoft technologies. These include WPF (Windows Presentation Foundation) and C#. I have had absolutely no prior experience with WPF, but I have used C# before during a temporary job. The best way of learning is by doing, so I am going to use these Microsoft technologies to create an application. I’m a little late with this post, as I was really tired after two days of hard work at CTC5 and had a good 12 hour sleep. Anyways, after the doors were opened, we all got back onto our laptops and continued with the development of our projects. My team began working on getting more jazz musicians into XML format and then into the database. I worked on adding more tables to the database (separating the musicians from their instruments) while other team members converted the data. At the end of the day, we had nearly six thousand musicians (out of the total nine thousand) in the database, and a user interface design developed by another team member. I also worked on creating a PHP front end and API, and while I didn’t get everything finished before the end of the event, our team did manage to create a functional prototype. Other teams worked hard on their projects too, and all of them gave some great presentations. It was awesome to see how fast development can be when a good team is put together. I learned so much about MySQL, PHP, and Python in the process, and I’m sure everyone else at the event learned something new too. A couple of the ideas of other teams have shown some real potential, and could be picked up and worked on by a larger team with more time and turned into something brilliant. I would like to thank the event’s sponsors: The University of Aberdeen, Aberdeen City Council, Fifth Ring, DANS-ON, and Eventifier. They helped pay for the food and drinks, and provided us with useful tools to help develop our ideas (such as Stattys Notes and marker pens). Still no job, so here I am doing more with my theme. I’ve added in the portfolio page now with some nice customization options too, including some randomly coloured portfolio blocks (when the pages don’t have images assigned to them) and an awesome library that allows me to have multi-line text overflow ellipses that no one will see because everyone uses screens with ridiculous resolutions nowadays! I also fixed a couple minor things mentioned in the previous post. I have added a portfolio section to this site, go check it out if you want to see what I’ve been working on. Only one thing there at the moment unfortunately, but with time, that section will grow. I’m going to start work building a 3D printer soon, that’ll be going up there. I might also stick some of this theme development stuff there too, since I have spent a long time on it.